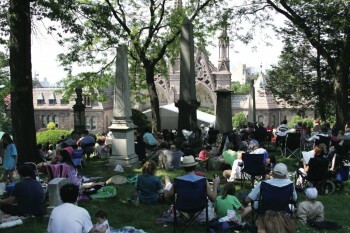 This year Green-Wood celebrates 15 years of bringing Memorial Day music to visitors from all over the area. The concert features the ISO Symphonic Band, founded in 1995 to sponsor talented students throughout New York City and led by ISO’s inimitable founder and conductor Brian P. Worsdale. Each year we feature the works of Green-Wood’s permanent residents Fred Ebb, Louis Moreau Gottschalk, Leonard Bernstein, and many others. Bring a blanket and enjoy this early summer performance. Food and refreshments will be on sale all day. Directly after the concert, enjoy a special trolley tour with Green-Wood Historian Jeff Richman. Click here for more information on the tour, and reserve your spot now – that tour fills up quickly! The concert is a free event, but please register your group using the Ticket Information box below so that we can gauge response. We encourage you to consider making an optional donation with your reservation, to ensure our ability to continue to offer these events free of charge. Please note that a free reservation for the Memorial Day concert does not ensure a spot on the trolley tour. Please contact 718-210-3080 with any questions.